SINGAPORE'S strong business ties with Tianjin - mainland China's fourth most populous city - are set to get a boost from market reforms there, officials said. The Singapore-Tianjin Economic and Trade Council (STETC) officials met yesterday in Tianjin, 120km south-east of Beijing. They oversaw 10 agreements for projects across environmental, education, health care and logistics services sectors. 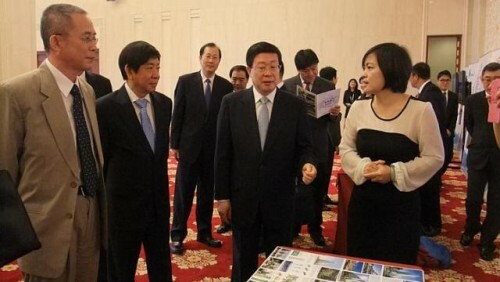 Minister for National Development Khaw Boon Wan, STETC's Singapore co-chairman, said: "Tianjin's shift towards a market-driven economy and the integration of Beijing-Tianjin-Hebei are new developments that will create many opportunities for our companies." The integration move would "improve the region's overall competitiveness in a green and sustainable way", he added. Industries and people are also set to move from Beijing to Tianjin and Hebei, which means inter-city transport networks need to be developed while workers have to be trained. Supporting services such as health care, education and environmental services will also be expanded - with Singapore firms already contributing in these areas. Market reforms include liberalising sectors, which Tianjin has already done for some services, to encourage more foreign investors. The education sector is one example. At the meeting, Singapore preschool firm Ednovation signed an agreement to set up kindergartens at Yanlord's developments, part of its Tianjin expansion plan. Mr Khaw added: "Our companies told me that they are also interested in the reform of Tianjin state-owned enterprises. They hope to collaborate in both shareholding and management reform." Singapore companies can also expect more government processes to improve, which will facilitate trade growth. For instance, Tianjin has already removed a minimal start-up capital requirement, and improved company registration processes and import or export clearance processes for packaging materials, since March. Singapore-Tianjin trade reached US$847 million (S$1 billion) while Singapore companies invested US$360 million in Tianjin in the first quarter this year. Noting that the likes of CapitaLand, Hyflux and Keppel have been in Tianjin for years, Mr Khaw said Singapore companies "continue to contribute and complement" the city's development.